Just Reduced! Best price in area for view home! Beautiful corner lot property with panoramic mountain views. 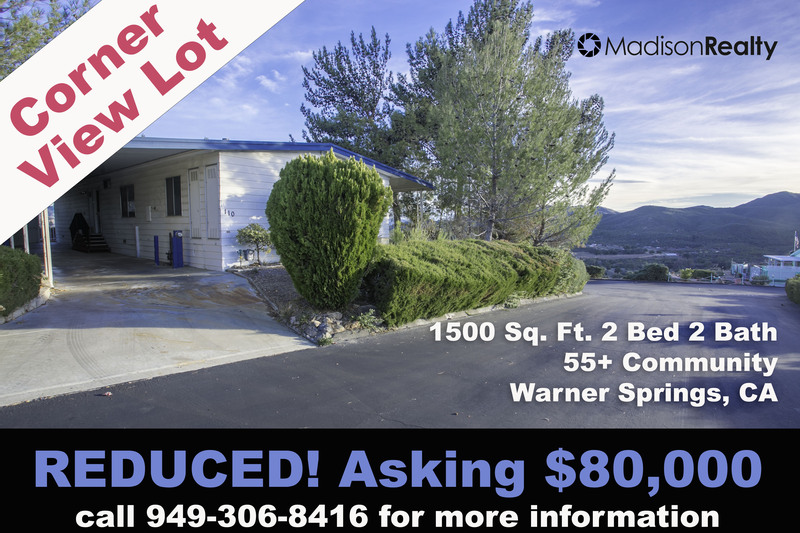 Located in Stone Ridge Senior 55+ community in beautiful Warner Springs. Private location with 2 car covered carport and covered patio. Separate family room and living room. Spacious dining room. Private Master Suite. A/C unit, Storage Shed in back. Affordable Senior Living near Warner Springs Ranch Resort where you can find golfing, hiking, biking, spa services and more. Also just 40 miles from Temecula for all your needs! Must See this view home! Founded as a working ranch in the mid-1800s and opened as a health and wellness retreat as well as a recreational destination in the 1920s, the historic Warner Springs Ranch Resort has gained considerable fame for its therapeutic natural hot springs and spectacular rural beauty. Warner Springs Ranch Resort (a portion of the resort to reopen in 2016/2017) features a 27,000 square-foot main lodge, 250 casita units, 2 restaurants, meeting facilities, 4 tennis courts, equestrian facilities, a spa, 3 swimming pools, campgrounds, a private airport and a championship 18-hole golf course and grill, general store, post office and medical buildings. Call Jesse Madison today at 949-306-8416 for more information.